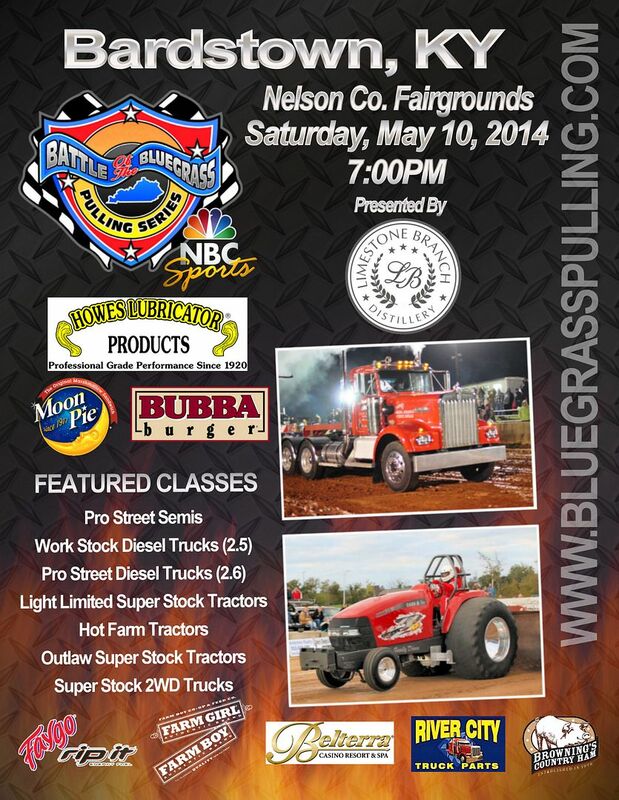 The Howes Lube Battle of the Bluegrass Pulling Series (BOB Series) heads, for the first time ever, to the beautiful Nelson County Fairgrounds in Historic Bardstown, KY, this Saturday, May 10, at 7pm. Classes to run include Hot Farm Tractors, Light Limited Super Stock Tractors, Work Stock Diesel Trucks, Pro Street Diesel Trucks, Super Stock 2WD Trucks, Outlaw Super Stock Tractors and Pro Street Semis. (not pull order). Admission is $12 for adults and kids 6 and under are free. For info about our series, check out out website, bluegrasspulling.com.